Bahía Salinas is located in northwest of the Nicoya Peninsula, close to the border with Nicaragua. The beach can be reached through La Cruz, the closest town to the Nicaraguan border Peñas Blancas. La Cruz itself is located 56 km (35 miles) north from Liberia at the Panamericana. A street that in the first part is tarred, but in the second part turns into a graveled road (accessible for all types of vehicles), leads from La Cruz to the horseshoe-shaped Bahía Salinas. Playa La Coyotera and the adjacent beaches are a favorite spot for windsurfers. Strong winds can be found mainly during the dry season from December to April. Another attraction of the area is the close-by Isla de Bolaños, nesting spot for numerous frigate birds, brown pelicans and the American Oystercatcher. Visitors are not allowed to enter the islands, but local fishermen can drive up to 50 meters (164 feet) to the islands allowing for a tranquil bird watching experience. Playa Nancite is best known for the egg deposition of the olive ridley sea turtle during the rainy season. The beach is located in the Santa Rosa national park which makes it necessary to ask for permission at the ranger station before entering this beach. Also Playa Naranjo is located in the Santa Rosa national park and is about 6 km (3.75 miles) long. Just like Playa Nancite, Playa Naranjo is a protected beach and offers a space for the egg deposition of the turtles between August and December. After the year 2000 the Papagayo Gulf has been highly developped by high end resorts such as the Four Seasons, Hilton and Riu group, advanced by the Costa Rican government. Playa Panamá is located in the Bahía Culebra at the Papagayo Gulf and is one of the prettiest beaches in the Guanacaste region. It is about 5 minutes by car from the well known beaches Playa del Coco and Playa Hermosa and offers fine, grayish sand and marvelous azure waters. Hotels: the luxury Mangroove Resort. Small, protected bay about 7 km north of Coco - relatively clean and good for swimming. Playa Hermosa features various restaurants directly at the beach as well as dive shops and equipment rentals (snorkeling equipment, sea kayaks, etc.) 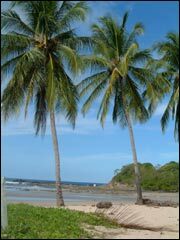 Playa Hermosa is also home to one of Costa Rica's most famous scuba diving companies - "Bill Beards Diving Safaris". The small, well protected bay of Ocotal is partly sandy and partly rocky. There is no village. The neighboring beaches/villages of Playa de Coco and Playa Hermosa can be reached in 10 or 20 minutes car ride. Activities: swimming, snorkeling, scuba diving, fishing, surfing. Playa Conchal is a light beach covered with shell sand - “conchas” which it is named after. Here, the famous 5-star hotel Paradisus Conchal of the Meliá Chain is located. The closest village is Brasilito and can be reached on a beach path within about 10 walking minutes. In contrast to Playa Conchal, Playa Brasilito (2 km north of Conchal) does not offer big hotel resorts. The small town of Brasilito is a relaxed beach destination and popular by local weekend and holiday travelers. Both beaches have been awarded the “Blue Flag” which guarantees the cleanliness of the water. A beautiful beach with white/gray sands and 1 km length. Ideal for relaxing away from the hustle and bustle. From here, Playa Potrero is easily accessible, for example. Playa Flamingo is also known as Playa Blanca because of its white sand and especially in older maps it will still appear under this name. In contrast to some of the other beaches in the environment, it is lined with vegetation providing shadows making it especially appealing. As the hotels are not located directly on the beach, Playa Flamingo still gives the impression of a virgin beach and with reason is supposed to be one of the prettiest beaches in Costa Rica. Playa Potrero is located about 5 walking minutes from Playa Flamingo and can be found in a pretty bay with calm water. At the northern end there is the fishing community of Potrero with a small fishing harbor. Playa Grande is one of the most important nesting places for the leatherback sea turtles. Since the 1991 it is part of the Las Baulas Marine National Park. There are hardly any accommodations close to the beach since construction within the boundaries of the park is prohibited and artificial ambient light must be kept to the minimum to protect the nesting turtles. Playa Grande is separated from the well known Playa Tamarindo in the south by a river mouth. Playa Grande is mainly visited by surfers and offers only little touristic infrastructure. Within only a few years, Tamarindo has changed from a fishermen’s village to one of the most popular and lively beaches for US American tourists. The long bay of Tamarindo with its light colored sand beaches is an ideal place for swimming and extended beach walks. There has been a lot of construction going on in Tamarindo and hardly a square-meter is left that is not owned by foreigners. The town of Tamarindo offers a large number of restaurants and bars to enjoy nightlife. Activities: golf, boat trips, horseback riding, sailing, scuba diving, snorkeling, fishing and surfing, night life. Playa Avellanas: Located north of Nosara, this village only has very little infrastructure and is popular with surfers thanks to the strong wave breaking and long waves. The deserted beach with fine, light sand is still a secret amongst the Costa Rican beaches. Playa Negra offers light sands and blue water, about 1.5 km (0.9 miles) long. Rocky cliffs and rock formations are favored by surfers. Located between the beach resorts of Nosara and Tamarindo, Junquillal is not very crowded and is definitely a great tip for tourists seeking tranquility. The touristic infrastructure is still at its beginnings, yet a few hotels in different categories can be found already. The village itself consists only of a few houses. The long, deserted, dark grey sand beach with high waves is the ideal place for surfing, long walks, horseback riding and scuba diving. The Ostional reserve borders the biological reserve Nosara in the south and is one of the most important egg deposition spots for the olive ridley sea turtles worldwide. In the months of July and November, thousands of turtles come this 1 km (0.6 miles) long beach to deposit their eggs. Those “arribadas” take about 3-7 days and takes place several times. October and November features the highest nesting rates (much more than 200 turtles per hour). Often, those nests are plundered by raccoons, white-nosed coatis and monkeys. The “hatchlings” – recently hatched turtle babies, are a prey for frigatebirds and seagulls about 45-55 days later when they hatch. The inhabitants of the area have the traditional right, to collect the eggs within the first 24 hours after the deposition and to sell those, as the first depositions usually are destroyed by the following ones. Playa San Juanillo offers are marvelous panorama with white sands and blue sea. A tongue of land,bathed by the ocean, offers theperfect backdrop for relaxation and a perfect swim in the ocean. Playa Nosara actually consists of 2 beaches: Playa Pelada and bordering in the south the Playa Guiones. Both beaches offer light sands, strong wave breaking and are suitable for swimming and surfing. There is only little developed infrastructure. Activities: Horseback riding, snorkeling, turtle watching (during the season) in the neighboring reserve Ostional. Playa Barrigona is a wide beach with light sands and is only partly recommendable for swimming due to the strong currents. Playa Buena Vista is a good beach for surf beginners, the northern part is formed by a river estuary. An ideal beach for sunbathing and walking. Playa Sámara is one of the nicest beaches on the Nicoya Peninsula. Not only is it a wide and beautiful, sandy beach but it is also very safe for swimming as there is a coral reef protecting the coast from waves and currents. Snorkeling, windsurfing and diving are some of the popular water sport activities available in this area. The vacation homes of many wealthy Costa Ricans dot the landscape. After the opening of the Tempisque bridge in 2003, Sámara can now be reached from San José withing 4.5 – 5 driving hours. Even though Sámara is somewhat secluded, you can find and buy anything you might need during your stay. There are restaurants and a few shops as well as a number of tour options. South of Sámara, Playa Carillo and the village of the same name are found. A pretty sandy beach south of Carillo in secluded located and only accessible via a bumpy graveled road or airplane. This is where the 5-star hotel Punta Islita is located. All rooms are built upon a gentle knoll nestled up against the mountains with a stunning view of the Pacific Ocean. During rainy season do NOT chose the route through the river! The relatively undeveloped area around Malpaís offers pretty sandy beaches which are suitable for swimming. They are, however, only accessible via a quite strenuous trip via Paquera. From here, also the Cabo Blanco nature reserve can be reached. For many years, Montezuma has been a favorite place for backpackers and hippies. During the last few years the small former fishermen’s village developed quite some touristic infrastructure, but still has maintained its charm. The natural beauty of the long stretched, light sanded beaches and jungle waterfalls located only minutes away from the shore attract visitors of all ages and budgets. Montezuma is best reached with the ferry to Playa Tambor and is also the gateway to Cabo Blanco nature reserve. Located at the southeastern tip of the Nicoya Peninsula (18 km /11 miles southwest of Paquera), this long beach with a fine light gray sand is protected by the wide Bahía Ballena which makes it suitable for swimming. Frequented mostly by locals on weekends, it is almost empty on most days which makes it ideal for long walks along the shore. The most important hotel is the 5-star hotel Tambor of the Barceló chain. Other recommendable hotels for the European tourism have been built south of Tambor as well: Tango Mar Hotel. Tours to the Isla Tortuga and the backcountry are offered.